It’s time for the Christmas Present Crochet-Along Project #2 to get underway. 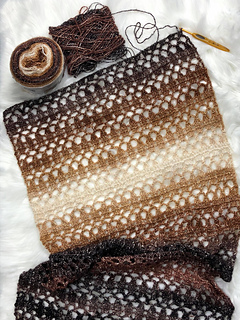 The Soft Pebble Shawl uses the stunning Shawl in a Cake with Metallic to give it the perfect shimmer and shine for a Christmas Party. You’ll be the talk of the night. If you want to join the fun, hang out with us in the ELK Studio Facebook group! You can also keep up with all the 2018 Christmas Present CAL project HERE. Click HERE for the link to the edging if you have trouble finding it.